There Is A Tide In The Affairs Of Men . . . . .
. . . . And to be caught at the ebb is a bugger. It seems that 'the powers that shouldn't be' are increasingly finding themselves high and dry. 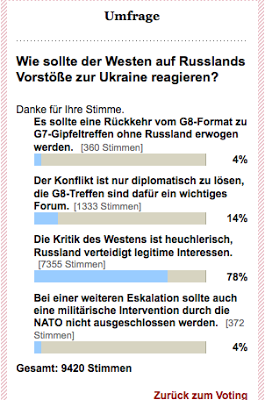 The German newspaper Der Tagesspiegel (Daily Mirror) launched an online survey on March 6th, asking its readers in faulty German of how the West should react with regard to Russia’s incursions into Ukraine. What follows were the different answers from which the readers could choose. That is some encouraging news, even if it was immmediately scrubbed. Seems the plebs are noticing the emporer has no clothes. "Russia 1, Regime Changers 0 - due to own goal"
Brian left a link to this story over on one of Penny's latest posts. I haven't followed up to confirm it is true. http://newswire-24.com/.../putins-2-move-checkmate-in.../. "According to an article published in privetsochi.ru Putin has brilliantly out smarted the US and Europeans in a couple of days and has earned Russia more than 20 billion dollars and has also managed to get an extra 30% stake within the lucrative Russian energy sector." "This story starts with the current situation in Crimea, when the ruble started to fall sharply, and the Russian central bank did absolutely nothing to support it, of course rumours started that Russia simply did not have a reserve currency to maintain the ruble. These rumours along with Putin’s statement that he was ready and would protect the Russian-speaking population of Ukraine led to a large drop in the share price of energy companies in Russia, as expected the “financial sharks” began to sell their shares. And sure enough the great strategist Putin waited all week and just smiled at the various press conferences (trying not to give away his plan I bet) and when the price fell below the plinth he then ordered his officials into buying shares at rock bottom prices. Of course by the time the European and American investors realised that they had been duped it was too late, the stocks were already in the hands of the Russians. This brilliant operation has to be the first in stock market history PUTIN BRAVO!" Thanks for the link, McJ. The bankers keep messing up because Putin is not afraid of them and is ready at all times to take advantage of everything they do. The bankers are going down.